Here is what perfectgame.com had to say about the Jayhawk League’s top prospects. 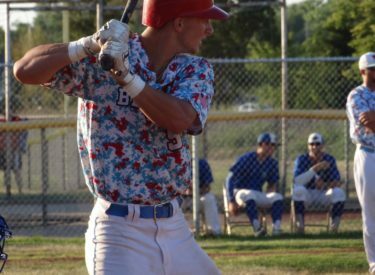 After leading Oklahoma State in home runs as a sophomore during the spring with 11 long balls, Simpson posted ridiculous video game-type numbers over the summer for the Hays Larks. He led the league is pretty much every category, slashing .451/.500/.797 with 12 home runs and 50 RBI. He shows a quick and compact lefthanded swing with a patient approach, although his stocky and compact 5-foot-9, 221-pound frame clouds his future potential, both at the plate and behind it. Robinson build off of a strong sophomore spring season at Murray State with an impressive summer, hitting .372-6-29 on his way to earning team MVP honors for the league champion Bee Jays. For as good as he was at the plate his infield defense at shortstop drew the most attention, displaying loose actions and slick fielding abilities to go along with a cannon for an arm, routinely recording 90 mph throws time to first base during the National Baseball Congress World Series scout day. Starks posted a 2.39 ERA during the spring serving as Stephn F. Austin’s closer, striking out 50 in 37 2/3 innings, and continued to fan batters at a staggering pace over the summer, adding 44 more, as compared to only six walks and nine base hits, in 24 2/3 innings serving as Hays’ late-inning stopper. He defies his 5-foot-8, 140-pound statures by throwing a fastball that hovers right around 90 mph, and commanding it well, to go along with a good breaking ball from the left side. While the stats don’t support his position as one of the league’s top prospects, posting a 6.03 ERA over nine appearances, which included four starts – not to mention playing on a four-win Oklahoma City team – Corbett has promising upside if the pieces come together for him. Built tall and strong at 6-foot-5, 225-pounds, Corbett throws a heavy low-90s fastball that bores in on hitters while mixing in a promising breaking ball that he has yet to find a consistent feel for. Corbett has transferred to Division II West Texas A&M for his junior year. At 6-foot-4, 185-pounds Carner had one of the best, most consistently hard fastballs, sitting at 93-94 mph all summer long. The numbers backed up his stuff while being used in a late inning, short relief role for the league champs, posting a 1.52 ERA over 13 appearances, striking out 33 and allowing just 13 hits and three walks in 17 2/3 innings. After posting a 5.54 ERA as a sophomore Carner could be a name to watch if he carries his summer success over to his junior year at Murray State.